“> Considered as the cult and sacred place for each Georgian, Mtskheta, the ancient capital of Georgia is located 20 km from Tbilisi. Nowhere in Georgia is there such a quantity of sacred and cult places as in Mtskheta. This is the reason why this ancient city is also named “the Second Jerusalem”. It is there that St. Nino of Kappadokia brought the good message to. It is there that one of the greatest relics of the Christian world, the God’s Tunic, is kept. It is there that streams of Christian pilgrims and tourists from all over the world flow to. The main attractions there are: one of the most ancient and esteemed temples – Svetitskhoveli Cathedral and ancient Dzhvari Monastery. They both are unique amazing samples of religious architecture of the medieval Caucasus. Mtskheta is located at the confluence of the two mountain rivers, the Aragvi, and the Kura on the river terrace surrounded by majestic mountain tops. The city legend says that Mtskheta was founded during times immemorial by the legendary tsar Mtsekhotos, the son of the first tsar of Kartli, who named the city in his honor. The facts of history testify that the city was founded in the second half of the 1 st millennium BC, i.e. at the same time as Eastern Georgian Kingdom – Kartli (Ibeia), the capital of which Mtskheta was. That is why Mtskheta is often called “the cradle of Georgian statehood”. As the political centre of Eastern Georgia, Mtskheta experienced its first blooming during the time Alexander the Great. The ancient city walls could withstand attacks of Roman legions and Persian soldiers. Mtskheta owned the status of capital for almost one thousand years until the end of the 5 th century AD – when Tsar Vakhtang Gorgasali decided to move the capital to Tbilisi. But despite this Mtskheta remained an important religious centre of the country, the residence of Georgian Catholicoses, the heads of Georgian church. 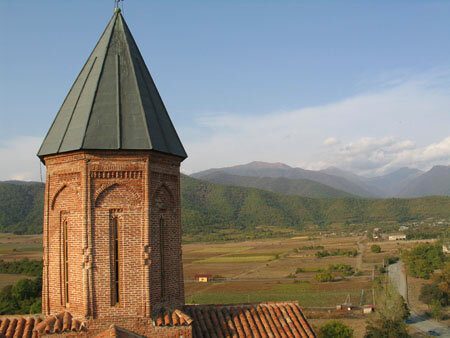 In the Middle Ages Mtskheta remained played the significant part as a trading, crafts and religious centre. Today it still remains the spiritual centre of the country. Along with Tbilisi and Пицундой Mtskehta is the cathedra of the Catholicos – the Patriarch of all Georgia. In the late 19 th – early 20 th centuries Mtskheta and its vicinities were declared the architectural and historical memorial estate in the list of the World Legacy of the UNESCO. Dzhvari monastic temple immortalized by Michael Lermontov (“Mtsyri”poem) is the most ancient cult monument constructed in the beginning of Georgian Christianity in the 6th century (585- 604). The name Dzhvari means “cross” in Georgian language. It explains the ancient legend which says that it was there that St. Nino of Kappadokia put the Sacred Cross symbolizing the acceptance of Christianity by Georgia. Later over the cross the Temple of the Sacred Cross was built. It is worth mentioning that Small Dzhvari temple was built first (lying in ruins next to the main temple), and Big Dzhvari was erected afterwards for the purpose of preservation of the Sacred Cross relic. According to the ancient records the Cross was open to be seen from afar and was the object of worship until the 6 th century. “The columns of the brought down gate, the towers, and the church arch…” – that was how Lermontov saw Dzhvari. Today Dzhvari looks the same as during the visit of Russian classic poet. The brought down stone walls with arch entrance and the temple itself seem majestic and strict. Its ascetic beauty is expressed in ideal proportions of the halls and the dome, in strict and straight lines, in smoothness of the external walls which do not bear any unnecessary decorative elements except the reliefs on their facades. Outwardly the temple looks like a big octahedral drum crowned by hexahedral cross-topped dome. Four premises adjoin the temple from two sides. Dzhvari interior is no less harmonious: pure, sound and complete classics enchants with its perfection. From the inside the church is decorated by a mosaic which has survived only in fragments. In the temple’s centre one can see the foundation on which the Sacred Cross brought by St. Nino of Kappadokia used to be fixed to. Dzhvari is standing on the edge of a high rock and is in wonderful harmony with the severe but extremely picturesque nature of this area. Below, at the foot noisy Kura and Aragvi, two most known rivers in Georgia, are flowing by. Right across lies the extensive panorama of Mtskheta. On the windy slopes near Dzhavari grows the Tree of Wishes. The pilgrims come there to fasten ribbons with the hopes that their wishes will be granted. In 1996 Dzhvary monastery reopened. Not far from Dzhvari there is another cult monument of Christian Georgia – one of the major Orthodox Georgian temples – Svetitskhoveli Cathedral. It was built in the 11 th century (1010-1029) on the site of the Twelve Apostles Church, the first Christian Georgian church erected in the 4 th century. There is a religious legend, connected with this church origination, about Elioz, a citizen of Mtskheta, who found the Tunic of Jesus Christ in Jerusalem. Elioz’s sister – Sidonia – died as soon as she touched the tunic. She was buried wrapped in it . Soon a big tree, cedar of Lebanan, grew on Sidonia’s grave. When tsar Mirian decided to build a temple on the place where the Tunic of the God was buried the cedar was cut down. They made seven columns from the tree and began to install them in the church. Six columns were in place but the seventh was not; it was hanging in mid-air. 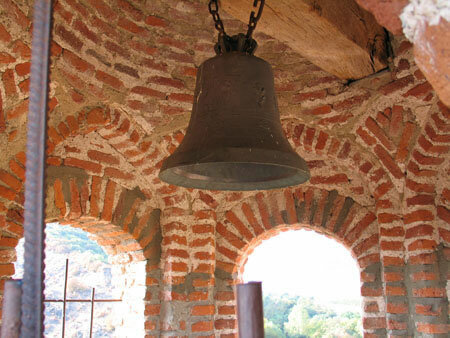 The Baptist of Georgia, St. Nino prayed all night long and then the column “without a touch of a human hand” froze on its place and … started shedding holy ointment. The miraculous chrism cured patients of heavy illnesses. Hence the temple’s name – Svetitskhoveli; in Georgian it means “the Life-Giving Pillar”. One of the greatest religious holidays of Georgia is Mtskhetoba-Svetitskhovloba is dedicated to the Life-Giving Pillar and the Tunic of the God. It is marked two times a year (on July13th and October 14th). In the 11 th century Melkhisedek, the Catholicos of Georgia, began building the new patriarchal temple on the place of the old church. There is a legend connected with this building too. “To build the temple Arsukisdze, an architect, was invited. When the building was ready it turned out that the masterpiece considerably surpassed the creations of his teacher. The teacher’s pride was hurt so he slandered his pupil and the architect’s hand was cut off. According to an alternative version the hand of Arsukidze was cut off by the tsar’s order so that he was not able to construct anything similar to Svetitskhoveli.” Probably the latter version is true as over one of the facade arches there is the relief with the image of a hand holding a setsquare. The inscription under the relief says: “the Hand of the servant of God Arsukidze. Remember”. Svetitskhoveli is a grandiose cathedral of cross-dome design. The side-altars decorated with arch reliefs symmetrically depart from the high cross-shaped facade from two sides. Behind the facade as if the second tier rises the basic building of the cathedral. It is of rectangular shape and in the middle of it towers the faceted drum topped with a peaked dome with 16 windows. The temple facades are decorated with stone carving characteristic for Georgian architecture of the late 10 th – early 11 th centuries. The arches frame the windows, carved reliefs and niches. One can see the figures of flying angels; they are the fragments of the previous temple built in the 4 th century. The windows ledges and frames are entirely covered with carved relief ornament which with other decorative ornaments harmoniously merges in the overall architectural and artistic image of the building. The interior of the temple is simple and full of light. The paintings fragments which still can be seen on the temple walls were mainly done in the 16 th – 17 th centuries. The fragments of frescos depict the scenes from the legend about the Tunic of God. Under the big arch there is the legendary “Life-Giving Pillar”. In front of the altar there is the burial place of Georgian tsars including Vakhtang Gorgasali, the founder of Tbilisi; Irakli II, the tsar of Kahetia; the tsars of Bagrationi dynasty and others. For the period of its existence Svetitskhoveli has been destroyed and restored a number of times. The most considerable reconstruction took place in the 15 th century when the current dome of the cathedral was installed and then in the 17 th century when the existing the hipped roof of the current dome was made along with repairs and the walls whitewashing. Despite this Svetitskhoveli has preserved that noble shape which Arsukidze gave to it in 1029. Even in the Middle Ages Mitskheta was the heart of Georgian church. Since then traditionally all major church ceremonies including the enthronement of the Catholicos-Patriarch are held in Svetitskhoveli Temple.